GREEK communists and their supporters met in north London on Sunday to hear a report by a leading member of the Communist Party of Greece (KKE) on the new European Communist Initiative and the ongoing struggle against reaction, opportunism and social-democracy at home and abroad. 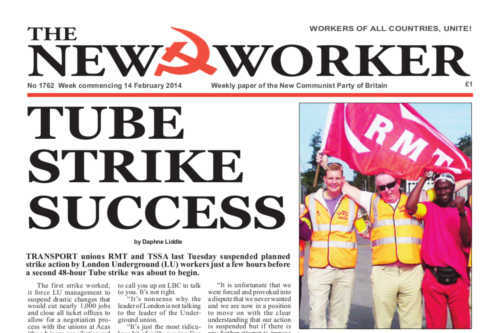 LAST WEEK striking Underground workers paralysed the capital’s transport system. This week’s planned 48-hour Tube strike has been called off following last minute management concessions during talks at ACAS on Monday. Some rabid Tory commentators are already claiming that London Underground, and by implication the Greater London Authority led by maverick Tory politician Boris Johnson, has caved in to the union demands. We received £285 in the post for the special fund this week which pushes the running total to £4,527 thanks to a Berkshire supporter who gave £100. A further £100 came from a stalwart reader in Surrey while a Deal friend gave £50. Big donations are always welcome but so are the smaller contributions that take us forward in our battle for survival like the extra £15 from a Manchester veteran, the £10 from a long-standing reader in Chadwell Heath and a tenner from another supporter in Berkshire.